The March 11 earthquake impacted all of us in Japan to some degree, but thankfully its effects were relatively minor in my city of Yokohama. We had a few weeks of shortages, some rolling blackouts, a sporadic train schedule. What we had the most of though was a feeling of horror and helplessness for those unlucky enough to be a few hundred kilometers north of us. Almost immediately after the earthquake, and like many people here, I was struck by the resolve and determination of the Japanese people, and had a desire to try to personally help in some way. I donated money and helped with some fundraising at my school, but this felt like an easy way out. What I really wanted was to go to Tohoku in person and help however I could with the monumental cleanup effort that is now taking place. My fiancée and I were able to find a volunteer centre a few kilometers south of Sendai in the town of Iwanuma that was looking for help. Sendai is surreally normal today, and the train line from there to Iwanuma is operating normally, so we were able to book a hotel room in Sendai for our stay. While we were able to help directly in the economic recovery by spending our money in Sendai, we realize just how lucky we were to have a hot shower and a comfortable bed each night – many other volunteers, including some of those that we worked with in Iwanuma are camping or sleeping in their cars each night. Arriving in Sendai felt much the same as anywhere else in Japan at the moment. Aside from the signs and posters of encouragement, there’s little evidence that anything has happened. While the lingering nuclear situation means that things are far from certain, there’s a strong desire to try to return to normal and get on with life. We arrived our first day in Iwanuma not really knowing what we’d be facing. The volunteer centre’s website mentions that most volunteers will be shoveling mud, but list few other details. We could see some damage to roofs of houses on the train ride up to Sendai, but didn’t know what kind of destruction we’d be encountering when we arrived. Fortunately, much of Iwanuma is several kilometers from the sea, a direct result of the lesson learned from a tsunami several hundred years ago, and so the main part of the town is largely intact and was not reached by the waters of the tsunami. Upon arrival at the volunteer centre (a converted senior’s day centre), we proceeded through registration and were given our task for the day. 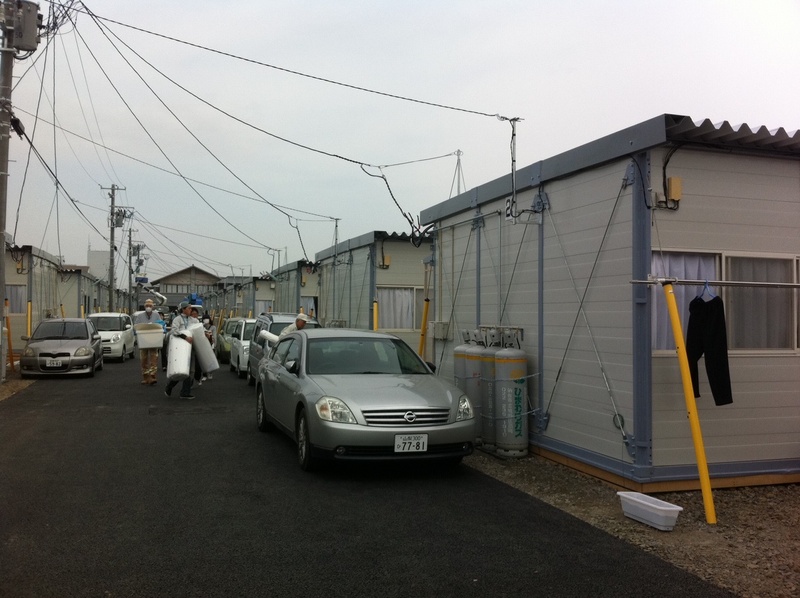 It’s now been two months since the earthquake and tsunami, and the legion of construction workers here have rushed to erect temporary housing for those living in emergency shelters. On day one, we were tasked with helping these people move their allotment of supplies into their new temporary homes. Working in teams of six or eight people, we gathered the simple supplies of futons and bedding, kitchenware, and the like. These families were overwhelmingly grateful and appreciative to have these things brought to them, but despite the relative comfort of their newly built temporary homes, I was struck by the fact that our groups of six people were now carrying essentially all of their possessions. We returned to Sendai that night tired and sore from carrying and lifting things all day, but still without having been directly in the tsunami-hit area. The next day would bring us work closer to the coastline, and our first glimpse of the mud now consuming the landscape.